AKIPRESS.COM - The Cassini mission continues to pay dividends long after its demise. The latest insights come from data gathered during its flybys of Saturn's largest moon Titan between 2004 and 2017, which indicate that the satellite has dust storms. 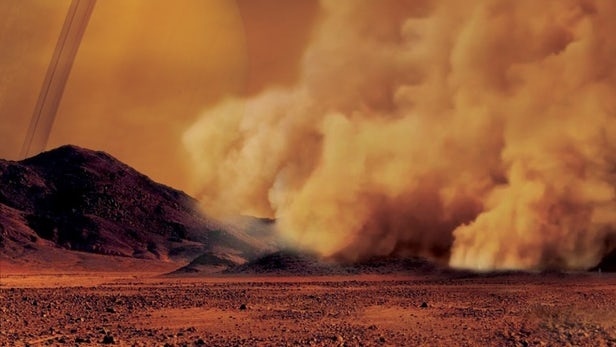 Not only does this make Titan only the third body in the system with dust storms after Earth and Mars, it's the only one where the dust is made up of complex organic molecules, New Atlas reports. In many ways, Titan is definitely the odd moon out in the solar system. It's the largest moon orbiting Saturn and the second largest in the system, making it even larger than the planet Mercury. More importantly, it's the only moon with a substantial atmosphere – one 1.45 times as dense as Earth that's composed mainly of methane and ethane laced with complex hydrocarbons. This exotic atmosphere means that not only is Titan unusually active, but it has actual weather similar to that of Earth with open lakes, rivers, and small seas. It also has seasons, rainfall, and cycles. The biggest difference is that instead of water, the system revolves around liquid methane and ethane with a temperature of 94° K (−179.2° C, –354.6° F). But now findings by a team led by Sebastien Rodriguez, an astronomer at the University Paris Diderot, France, indicate that Titan also has a very active dust cycle with storms that are visible from space. However, unlike Earth and Mars, this dust is made up of complex organic molecules formed by the intricate cryo-chemistry of the Titanian atmosphere. These molecules form in clouds and are generated in such quantity that they "snow" down on the surface at the equator to form large dune fields. Scientists already knew about this dust from when the unmanned Huygens probe touched down on the surface of Titan, but that didn't mean there weren't surprises in store.